This article will provide instructions on how to conduct direct discovery of a MindWare Mobile. The automatic discovery method requires that broadcast UDP packets can make it from the PC to the Mobile. Direct Discovery can be used for restrictive network environments where these packets are blocked. 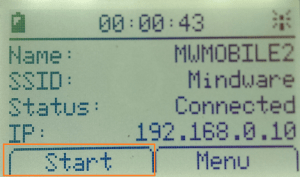 Turn on the MindWare Mobile and let it connect to its associated router. Once the Mobile connects to the router it will be assigned an IP address. In this example of a Mobile’s screen an IP address of 192.168.0.10 has been assigned, but is likely different for each individual Mobile. Open BioLab. 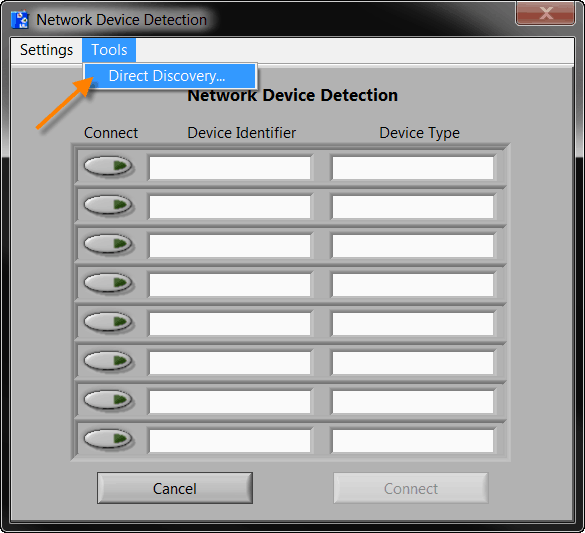 If the direct discovery window does not appear than the acquisition source needs to be changed to “Ambulatory Wi-Fi” mode as seen in the image below. 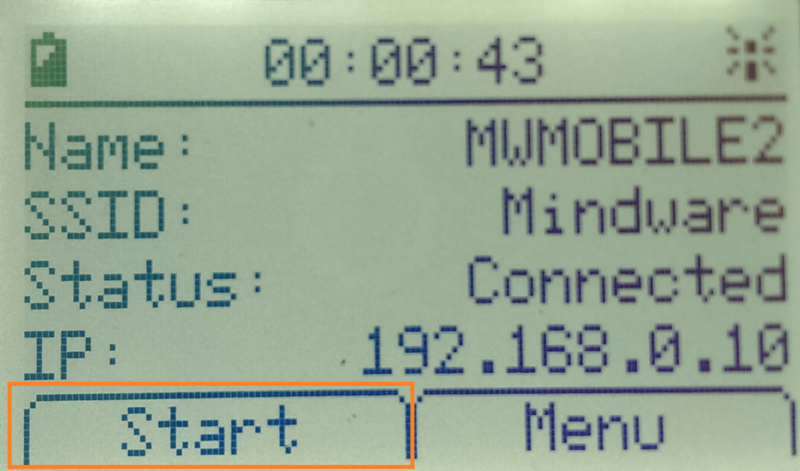 Once the acquisition source is changed to “Ambulatory Wi-Fi” mode the Network Device Detection screen will appear. Select “Start” on the Mobile to enter discovery mode. Once Direct Discovery has been selected a new “Direct Discovery” window will appear. 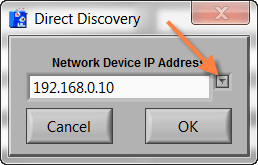 Enter the associated IP address for the Mobile from step 1. A drop down menu is available that will save the IP addresses of Mobiles that were previously directly connected. 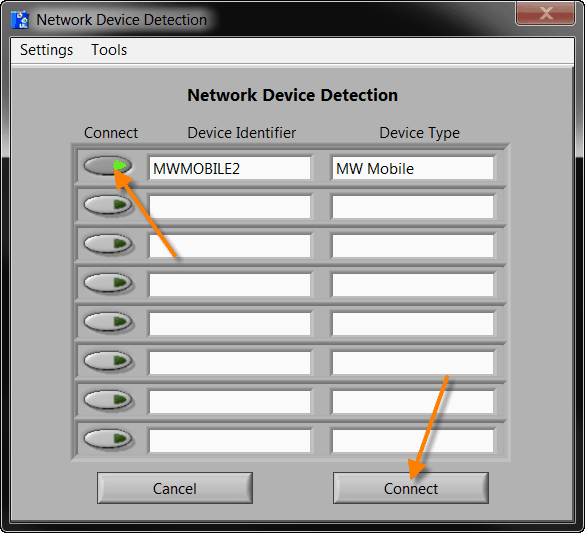 After a few moments the Mobile will appear on the Network Device Detection screen at which point the green “Connect” button should be pressed to enable all desired channels. 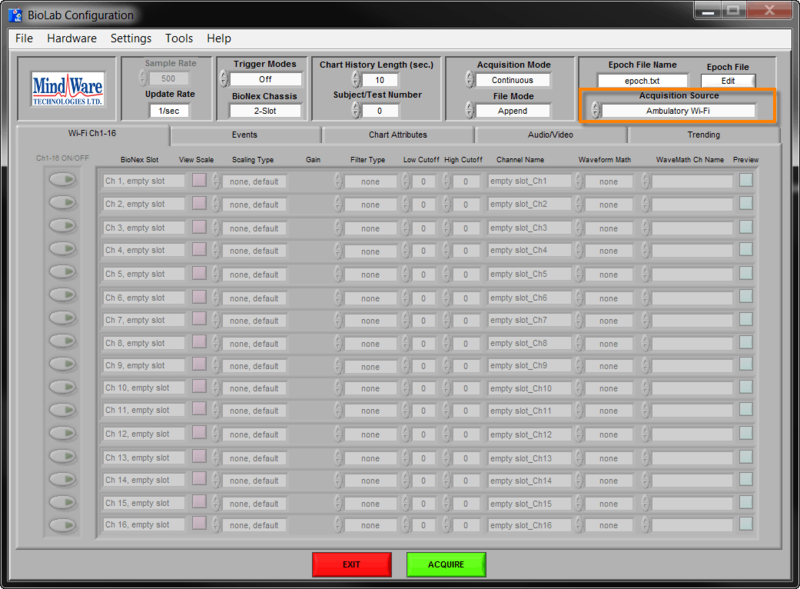 After the channels are selected press connect at the bottom of the screen.